chapter 1 - You made it here. You must like books! I have promised this on Facebook and some other social media already: once I have translated the first chapter of the first book about Kobie, I will post it here, so people can let me know if they want to see more of it. In other words: would you like a complete English version of this story? Let me know, either in comments, through the contact form or any other form you fine palatable! I’m not dumping the chapter in here just like that. If you want to avoid seeing it, simply don’t click below. Otherwise… do it! Click here to read the chapter! As is my happy habit before the actual publication of a new book, I am more than happy to present to you the first chapter of a new book. It’s about pirates, but not just them. We also have a dragon, Baba Yaga, King Walt and his dear wife, and a number of new people. But now, without further dillying and dallying, here is chapter 1! The new stuff in a new way. Francis and Frankie. 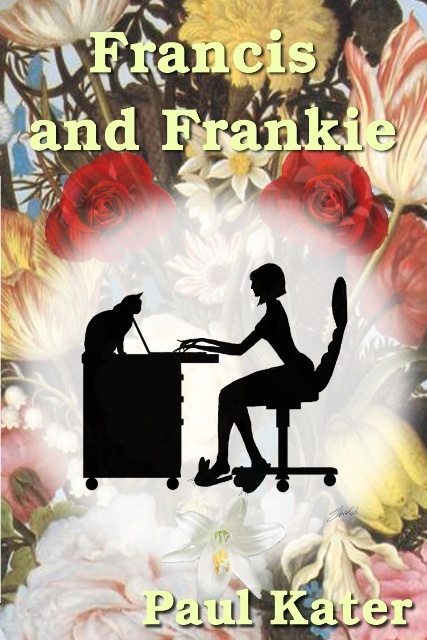 I probably won’t surprise you with the title: “Francis and Frankie”. (Although for a while it might be “Frankie and Francis”.) I’m going a different road with this book and I’ll see if I like it. (Do you notice I don’t take your feelings about this into account? Good.) Today is the showing of not only the cover but also the first chapter! And the book should see the light of the e-book stores next weekend. I’ve decided not to wait for the paper version to be done this time. That is a lot to process I guess, even for me, but somehow, together, we’ll get through this. So, if you are ready for more, do click the following link to catch the first chapter! Author PaulPosted on September 19, 2015 September 19, 2015 Categories new releaseTags chapter 1, cover reveal, urban fantasyLeave a comment on The new stuff in a new way. Francis and Frankie. Hilda 16 – Here is chapter 1. As is the custom on this blog / website, it is time for me to reveal to you the first chapter of this new book. I hope it is not too disappointing for you. Trust me, Carol (my precious editor) and I have worked very hard on this one. We hope you appreciate our efforts. Author PaulPosted on August 22, 2015 August 11, 2015 Categories new releaseTags chapter 1, Hilda, new releaseLeave a comment on Hilda 16 – Here is chapter 1. Til Death Us Do Join, Chapter 1. As is tradition in this non-traditional house, this is the moment where chapter 1 of a new publication will the thrust into the world. As you are reading this, this means you are part of that world. I hope you will enjoy chapter 1 of “Til Death Us Do Join“. Author PaulPosted on July 11, 2015 July 11, 2015 Categories new releaseTags chapter 1, new releaseLeave a comment on Til Death Us Do Join, Chapter 1. Welcome again. Last week I introduced to you the cover of my new book, Wanted: hero. Today it’s time to let you read the first chapter of the novel. As is my habit by now, I’m going to show you the first chapter of the next book that I’m bringing out. Today it is the first chapter of “Who killed the clown?“, the first attempt I am making to writing a detective story. A Pagan detective story even. I hope you enjoy it! With great pleasure I give you the first chapter of the new Hilda book. It won’t be long now until the book will reach your favourite reading devices. I’m still working on the paper edition but may your lust for a new adventure be present and quenched a bit by what you’ll read here! As is customary for me before publishing something new, last week you saw the cover of the new book. And this week it’s “Chapter 1” time! I hope you will enjoy the start of Clara’s Eyes.